Easily peel potatoes, carrots, and apples. No hassle of a knife or a hand held vegetable peeler. 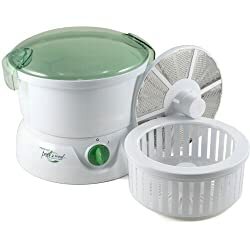 The Presto peel a meal electric peeler even comes with salad spinner. All you need is your food that you want to peel and 1 3/4 cup of water. If your potatoes are too big you will need to cut them crosswise so they will fit easily inside the peeler. A full load consists of - 12 small potatoes, 6-8 medium size potatoes, 3 large potatoes (cut in half crosswise), 4-6 medium apples, or a single layer of carrots.